Depending on where you’re staying and diving in Roatan, you might be able to do one of these sites if your dive center has it on their schedule for that week. These sites are all in completely different areas so don’t expect a single shop to be driving you all around the island to hit each of them. Divers in West End and West Bay might get to Kieran’s favorite site. Divers staying on the north side might get to Rika’s favorite while divers on the south side might get to Sarah’s. Saaya and Caroline picked favorites a bit farther out – these would be specialty trips for pretty much any dive shop. Alternatively, some shops will offer concierge diving so you can pick and choose wherever you want to go (weather permitting). Without further ado, here are the best dive sites around Roatan according to those who dive here every day, AKA my friends. Why she loves it: I have many favorite sites depending on what mood I am in and what I want to see. If I want large expanses of coral, I go to Cordelia Banks; ripping current and a chance to see hammerheads, I go to Texas (editor’s note: not the state, guys, it’s a site at the western tip of Roatan); tiny and wonderful creatures, I go to Butchers Bank. But if I had to narrow it down to one favorite site it would be Helene Banks off the eastern tip of Roatan. The shallows are packed with acres of lettuce and finger corals, sea fans, and macro life. And the wall is just stunning. It is steep, covered in sponges and corals every color of the rainbow, and has a current that puts Texas to shame. The only downside is that you do not get many larger fish or turtles due to the poaching on that end of the island. Caroline is an incredible underwater photographer – check out her Facebook page! Her video of orcas killing a tiger shark went viral last year, so if you missed it go check it out. She is a property manager with awesome locations in West End. Contact her to book your vacation rental! Why he loves it: I love meandering through the coral bommies of this big 45-foot deep sandy lagoon, looking for pipefish and the occasional pipehorse. It’s a good place to see some larger critters like Stingrays and if you’re lucky a Spotted Eagle Ray or two. Sometimes when there is some current you can see a magnificent school of Horse-Eye Jacks. I always try to take my Open Water Students here for dive three or four. Click here to see Scuba Kieran’s Facebook page for fun updates and photos all around Roatan. He also posts lots of cool videos on his YouTube page and his Instagram photos are fabulous. Why she loves it: Rockstar is a hidden gem on the north side. Named after some hard-partying Palmetto Bay Plantation homeowners and located near Pristine Bay, this site is one of my favorites because its location away from dive shops means it only has divers on it once in awhile, so you’re almost guaranteed a private site in very healthy condition. Divers descend directly into a large trench with spooky overhangs and head east through the trench. Free swimming nurse sharks, turtles, massive barracuda and spotted eagle rays are often sighted around the trench. After exiting the trench, huge coral pinnacles are waiting to be explored before arriving at a sheer vertical wall blooming with colorful soft coral. Finally, near the end of the dive you head up into the shallows where a resident green moray eel likes to come out and play while you get up close and personal with tiny nudibranchs and schools of horse-eye jack. Click here to check out Rika’s in-depth diving info, fantastic Roatan Reviews for local businesses, and see how she executed an epic Cubicle Throwdown on her blog. Subscribe so you can get her entertaining updates straight to your inbox. Why she loves it: One of my favorite areas is the seamounts of Cayos Cochinos. They’re located 18 miles off of Roatan so trips there are really weather dependent, but that makes them more special because we only go there a few times a year. The diving can be quite challenging because of all the currents, but it’s also very rewarding, with an abundance of soft coral and big schools of Atlantic spadefish, big-eyed jacks and barracuda that feed in the current. There’s a deep and shallow seamount, so you can get in two dives out there. The deep seamount offers a chance to see bigger pelagic fish, but I think I prefer the shallow seamount because sunlight filters through so nicely onto the reef. Click here to see more of Saaya’s “Top Sites Roatan” video series, plus tons more amazing footage from UMI Productions. Don’t forget to Subscribe to the channel to be notified when she posts some new footage! Why she loves it: The reason I like Menagerie so much is the healthy reef wall that drops straight down, providing a huge canvas of every Caribbean coral and sponge imaginable! It’s very colorful and faces a beautiful deep blue backdrop. In addition, the wall is full of life. Loads of fish, crab, lobster, eel, and a popular home to Seahorses living tucked up under the coral shelves. There are so many textures and shapes and colors, I could spend hours and hours taking it all in. You need to check out Sarah’s blog for some amazing travel photos and write-ups from Roatan and beyond. Also follow her on Instagram, and then help me encourage her to start a Facebook page for her photography! So there you have it! 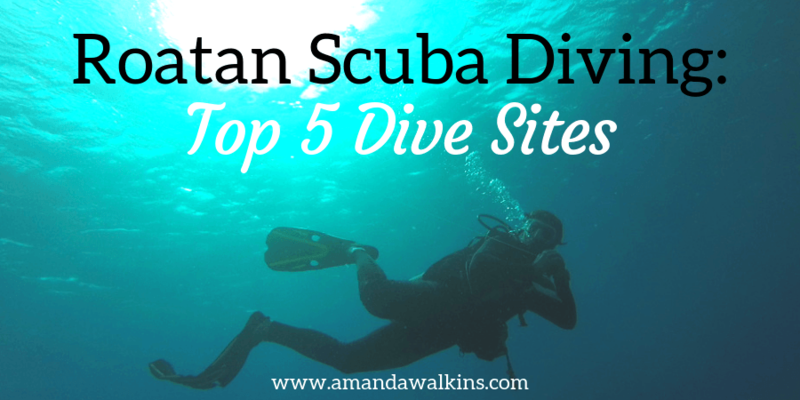 The top 5 best dive sites in Roatan as determined by the industry professionals (AKA my friends). Thanks for contributing, amigos!